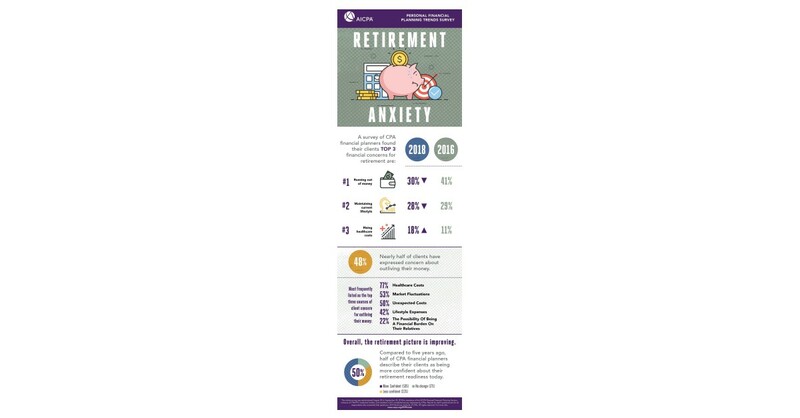 NEW YORK–(BUSINESS WIRE)–Of all the concerns impacting Americans’ retirement today, running out of money, maintaining their lifestyle and rising healthcare expenses continue to top the list. This according to the American Institute of CPAs (AICPA) Personal Financial Planning Trends Survey which was conducted August 20 through September 24, 2018 and includes responses from 631 CPA financial planners. Running out of money is the top financial concern of clients planning for retirement, cited by 30 percent of CPA financial planners. This reflects an improvement from the AICPA’s 2016 survey, which found 41 percent of clients listing it as a top concern. This is likely due to the economy’s steady improvement over the last few years, with the stock market continuing to climb despite volatility. Clients worried about maintaining their current lifestyle and spending level (28 percent) in retirement was a close second financial concern. Stress from rising health care costs (18 percent) was a distant third. However, with medical costs forecast to continue growing throughout 2019, it is not surprising that this concern is up 7 percentage points from 2016. Nearly half (48 percent) of clients have expressed concerns about outliving their money, according to the survey. Interestingly, that outweighs the 39 percent of planners who have concerns about their clients outliving their money. This underscores the extent to which even well-positioned clients are stressed over the prospect they’ll outlive their cash. When asked about the top three sources of client financial and emotional stress concerning outliving their money, healthcare costs (77 percent), market fluctuations (53 percent) and unexpected costs (50 percent) were cited as the top issues. Additional causes for financial stress include lifestyle expenses (42 percent), the possibility of being a financial burden on their relatives (22 percent) and the desire to leave an inheritance for their children (21 percent). Even with adequate planning, retirement becomes more complicated as clients age. In fact, 57 percent of CPAs are seeing long term care issues impact their clients’ retirement planning more frequently than they did five years ago. Only one percent saw this issue crop up less often, with 42 percent saying they had not seen a change. Fifty percent of CPAs saw an increase in clients taking care of aging relatives, with only 3 percent seeing this issue less often, and 47 percent saying about the same as five years ago. The survey also found 45 percent of CPAs citing diminished capacity as an issue impacting clients’ retirement planning more often (3 percent less often, 53 percent about the same) than five years ago. Collectively, these issues demonstrate the competing challenges individuals face when planning for their retirement and the need for expert planning advice to meet their goals. On a positive note, as the labor market has continued to improve more than a third (36 percent) of CPAs said job loss is impacting their clients’ retirement planning less often compared to five years ago (55 percent about the same, 9 percent more often). “It is incumbent on financial planners to act sooner than later when planning for their client’s late retirement years. Particularly, they should address client concerns about long-term care and the prospect of diminished capacity to ensure their clients wishes will be carried out,” added Millar. Despite a number of concerns, the overall retirement picture for clients of CPA financial planners is improving. When asked to compare their clients’ current situation to five years ago, half of CPA financial planners (50 percent) say their clients have more confidence they’re ready for retirement. That outweighs the third (33 percent) that stated they find their clients to be less confident. Another 17 percent saw no change. 1. Don’t Wait, Explore Long Term Care Coverage Early. As individuals are living longer lives, having a plan in place for a serious illness or incapacity is critical for maintaining peace of mind. Individuals should first consider all the options available for dealing with prolonged medical and personal care in a way that accomplishes their goals within the constraints of their financial situation. Individuals should compare the relevant options such as traditional long-term care insurance, hybrid long term care insurance, Medicaid options, or self-insuring. However, they should not wait to explore coverage options. Applicants over 70 years old run an increased risk of being denied long-term care insurance due to health issues. 2. Don’t Look at Your Portfolio Too Often. In any given year, the stock market has an approximately 70% chance of going up in value. However, on a daily basis that likelihood decreases to approximately 53%. Just understand that markets will fluctuate wildly in both directions but have historically gone up over long periods of time. Checking your portfolio daily can tempt investors to make short-sighted decisions that can easily derail an otherwise sound portfolio allocation. 3. Ramp up Savings by Taking Advantage of Catch-Up Contributions Once Age 50. Catch-up contributions are a great strategy for those who are age 50 and over and looking to secure the likelihood of a successful retirement. Individuals age 50 and over can make an additional $6,000 contribution to their 401(k) or most other employer-sponsored retirement plans for 2019. For IRAs, an individual can contribute an additional $1,000. 4. Have a Tax-Efficient Drawdown Strategy. Be sure to have a plan for how to best consume retirement savings tax-efficiently in retirement. Without thoughtful planning, taxes can take a hefty bite out of cash flow and that’s especially painful when living on a fixed income in retirement. It’s critical to be mindful of retirement withdrawals bouncing you into a higher tax bracket, affecting taxes on Social Security benefits, and triggering higher capital gains taxes and other adverse tax consequences. 5. Plan to Pay off or Pay down Debt Before Retirement. As individuals enter retirement and reach the end of the accumulation phase of their life, the continued use of debt should be revisited. Debt is generally unfavorable for individuals in retirement as it hurts their cash flow. Managing cash flow is critical because retirees typically live on a fixed income derived from their investment portfolio, social security, and pension plans. When approaching retirement, it is prudent to review all outstanding liabilities and decide whether any debt should be paid down or paid off while you still have the financial flexibility to do so. Seven in ten CPA financial planners (70 percent) say they discuss their clients’ estate plans with them at least once a year, and nearly a quarter (23 percent) do it once every 3-5 years. The AICPA’s PFP Trends Survey is administered as an online survey to CPAs who are members of the AICPA Personal Financial Planning Section, including those holding the CPA/PFS credential. It was conducted from August 20 through September 24, 2018. The AICPA’s Personal Financial Planning (PFP) Section is the premier provider of information, tools, advocacy, and guidance for CPAs who specialize in providing estate, tax, retirement, risk management, and investment planning advice to individuals, families, and business owners. The primary objective of the PFP Section is to support its members by providing resources that enable them to perform valuable PFP services in the highest professional manner. CPA financial planners are held to the highest ethical standards and are uniquely able to integrate their extensive knowledge of tax and business planning with all areas of personal financial planning to provide objective and comprehensive guidance for their clients. The AICPA offers the Personal Financial Specialist (PFS) credential exclusively to CPAs who have demonstrated their expertise in personal financial planning through testing, experience and learning.